Your preschooler can count 1-10. Your preschooler can identify each number amount correctly. Don't rush it. Preschool is preschool for a reason. You have plenty of time to build upon the basics. Allow your preschooler to play, maniupulate, and discover concepts on their own. Of course, you can begin to introduce numbers above 10. However, truly mastering the numbers 1-10 will come in handy down the road. Why is Quick Number Identification such as automatically recognizing "This is a group of 5" Important? Allows more time to think through problem solving of word problems since the number amount is already automatically recognized. 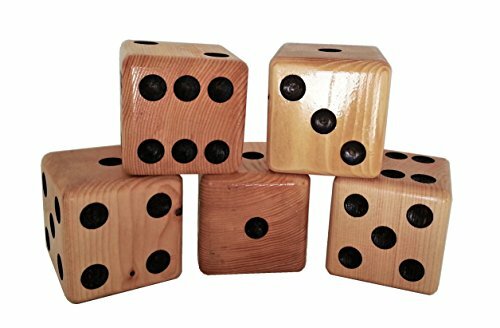 These outside yard dice are an Amazon Affiliate link. The dice are a perfect size for little hands and you get 5 in the set. Draw 6 boxes with a number in each box. Decide where the dice needs to get placed after rolling. You will notice that number recognition will increase the more your preschooler rolls and matches the dice with the correct number name. Give it a try! Tag us if you do. Let us know what you think about these dice. You can find more information about numbers, counting and tips here.